BibleTime is a completely free Bible study program. The program's user interface is built with Qt framework, which makes it run on several operating systems. 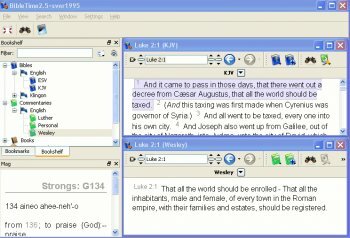 The software uses the SWORD programming library to work with over 200 free Bible texts, commentaries, dictionaries and books provided by the Crosswire Bible Society. This app is an open source project which means FREE. This isn't just a Bible. This app has different versions of the Bible. It also has books relating to the Bible. I can download from the ftp servers books such as "The Complete Works of Josephus Flavious, The Lexicon, Bible Dictionaries, just to scrape the surface. The GUI is OK. I recommend this app to the serious bible student and scholar. I have wanted something like this for long time without paying and arm and a leg for and never expected to come across a free app. I'm glad I tried it out.